Which management plugin is the better alternative for my blog? With more and more competing premium WordPress plugins it gets harder and harder to answer that question. This article takes a look at two popular plugins to manage multiple WordPress sites: It compares InfiniteWP with MainWP in order to help you with your decision in choosing one. There are several other alternatives to InfiniteWP and MainWP on the market which I have compared in separate articles. Go to my main WordPress Management Software comparison to start your search. Please note that this comparison only looks at the features on paper as reported by either plugin’s developers. It does not and can not tell you if or how well a certain feature will work for you. Because such a verdict would depend on too many variables, including your server setup and personal preference, I have decided to stick to the hard facts for this feature comparison between InfiniteWP and MainWP. In my comparison I track 35 different features for all the WordPress management plugins. In InfiniteWP you can find 27 out of 35 of those features. MainWP on the other hand offers 31 out of the 35 features in total. Even if many of the features compared above overlap between those competing products there is one very important difference: InfiniteWP as well as MainWP both provide a unique interface and dashboard from which you will manage all your WordPress blogs (pictured below). Since it is hard to rate the quality of such an interface objectively I recommend that you try both products yourself by signing up for the free trial offered by either service. WPscoop indexes the exact prixing plans of all compared plugins. Please refer to the table below for a quick overview of the prices of InfiniteWP and MainWP. To find the cheaper management plugin for your individual needs please go to my main comparison article. There you can search for the features you need and then see the exact price you would need to pay for InfiniteWP or MainWP (as well as other alternatives). Most WordPress plugins have an option to test their service for free, either thrhough a basic free version, a trial period or online demo. Check if such an offer exists for InfiniteWP and MainWP and if so: Make use of it! By doing so you can compare both plugins directly and find out which one is the better alternative in you situation. But wait, there is more! 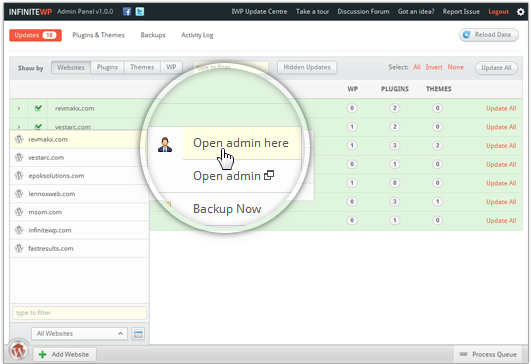 Besides InfiniteWP and MainWP I have compared several other WordPress management plugins on WPscoop. 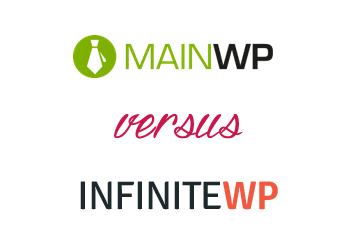 I recommend you start your search for InfiniteWP alternatives or MainWP alternatives in the main comparison article. There you can filter all different products and search for the features you need. Which one is the better blog management service: InfiniteWP or MainWP? Please share your opinion or experience in the comments! One important thing you have neglected to mention here (as far as I can see) – and that is, whilst infinite WP seems a bit more widely used – they hardly ever release any updates! Sure, there are some security related updates released by IWP for the core code (when someone discloses a security issue that is), but the plugins rarely seem to be updated. When I was originally considering the choice between MainWP and IWP, I signed up for both MainWP and IWP to try them both out. I eventually decided on IWP as I had some teething issues with MainWP. However, I still receive the Main WP update emails – probably one a week, notifying users of a new feature of some kind or of some bug fix update. This seems very impressive – as is the fact that all their addons now appear to be offered with lifetime licenses (as opposed to IWP that are not currently lifetime licenses and must be re-newed each year) – in other words, MainWP will (currently) cost you $399 once and then you’re set for all current and future releases – seems a good deal. IWP certainly is a very useful and relatively straight-forward application. But the biggest downfall is that there is a sever lack of communication from them on their Facebook page, or blog. Very few add-on updates seem to ever happen, and there does not appear to be a lifetime license on offer. I am seriously considering switching to Main WP just to give it a go! Ok, so I took the time and loaded both IWP and MainWP these last two days. IWP seems like the better solution for just the free version and no plugins for both. Haven’t decided which I’m going to choose as of yet but so far it looks like IWP. Upon install and loading 93 sites in each, iwp was ready to update my plugins and seems to work great. For the life of me, i can’t figure out how to update the sites yet in mainwp, even looked at the extensions to see if it was a special extension that was needed to do so. I think IWP for me, plus Yoast had good things to say about them and he knows his stuff so … lol I may use both as the free version of mainwp has some cool features that may come in handy, and well, all my sites are now loaded in both. I really like how IWP is easy to install and when you copy the data for the management side, it pastes the info in all three spots with one action. Hope this helps someone. Thank you for posting your feedback and experience here! Feel free to give a rating to both on my MainWP reviews and InfiniteWP reviews page as well.